I have been wanting to write about Cookie Cravings for a long time. More than a year. I meant to write about Cookie Cravings BSS (Before Seventh Son). You may have heard the phrase, it takes a village. In the case of Cookie Cravings, I think they were the tipping point for Italian Village and it’s renaissance. (Let me not fail to mention pioneer Michelle Hill at St. James Tavern for planting her feet in Italian Village more than a decade ago). 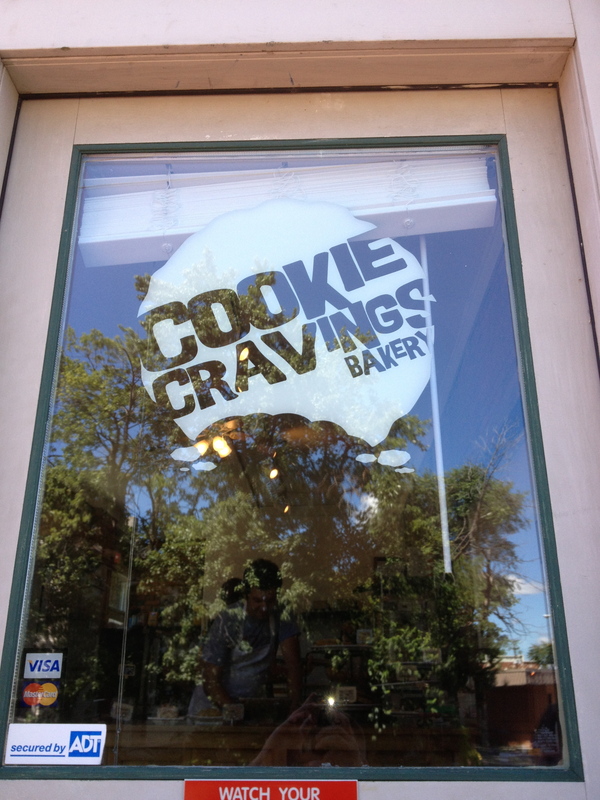 Cookie Cravings started as….a place that did cookies, really good ones. And over time, it continued to grow and expand the menu while reconfiguring the space too. Add in a few picnic tables, some chairs and signs to help you find the place (you need to know where to look) and Cookie Cravings really creates a sense of home. It has also given a food outlet to the starved denizens of Italian Village. What started as a pop up creperie on the weekends became a regular breakfast destination with all kinds of crepe and sandwich offerings – plus the occasional sticky bun. Matt and Lindsay Tewanger have worked hard to create a place for the community and offer what their neighbors asked for to make Italian Village start to feel like the Village it was meant to be, where neighbors walk to a corner shop and come back again. It takes a good meal to keep the Village in the village instead of driving away to the burbs. And those that visit walk around and think that they could see themselves there too. I recently popped in for a breakfast. I had a bite of a perfect crepe but spent most of my efforts on a breakfast sandwich recommended by Matt called the California Club. 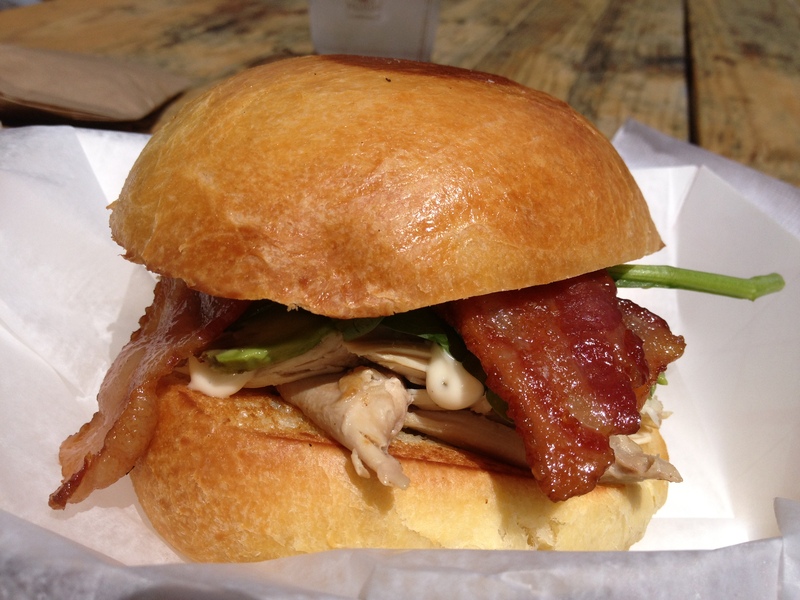 In between one of his Brioche rolls was a stack of roasted chicken, avocado, bacon, fresh spinach and a dollop of garlic aioli. See below. It tasted as good as it looks. This entry was posted on July 31, 2013 at 7:46 PM	and is filed under CLOSED. You can follow any responses to this entry through the RSS 2.0 feed. You can leave a response, or trackback from your own site. I’ve been a huge fan of Matt’s since back in the day when he was the chef at McConnell Heart Health Center where I go to the gym. Matt knows how to make good stuff! He also knows how to make stuff that’s good for you. He and Lindsay have done an amazing job with Cooking Cravings. The food, the atmosphere, the sense of community all make you want to go back for more. Best cookies in the world! Great cinnamon rolls. Amazing new lunch and breakfast creations. What’s not to love? !